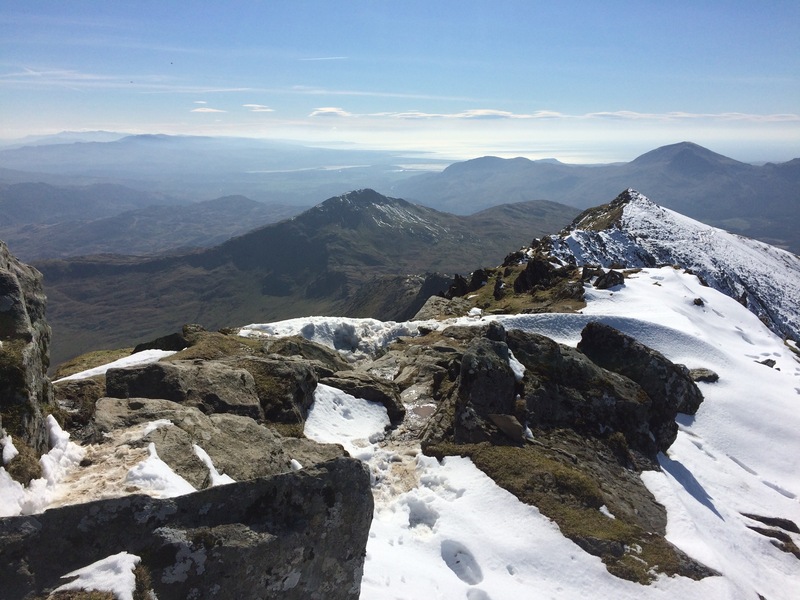 I’d been watching the weather forecast for most of March waiting for a few days of good weather to attempt a triple SOTA (Summits on the Air) activation in Snowdonia and, on 24th March 2017 I saw a gap in the weather that looked perfect for a flying visit. 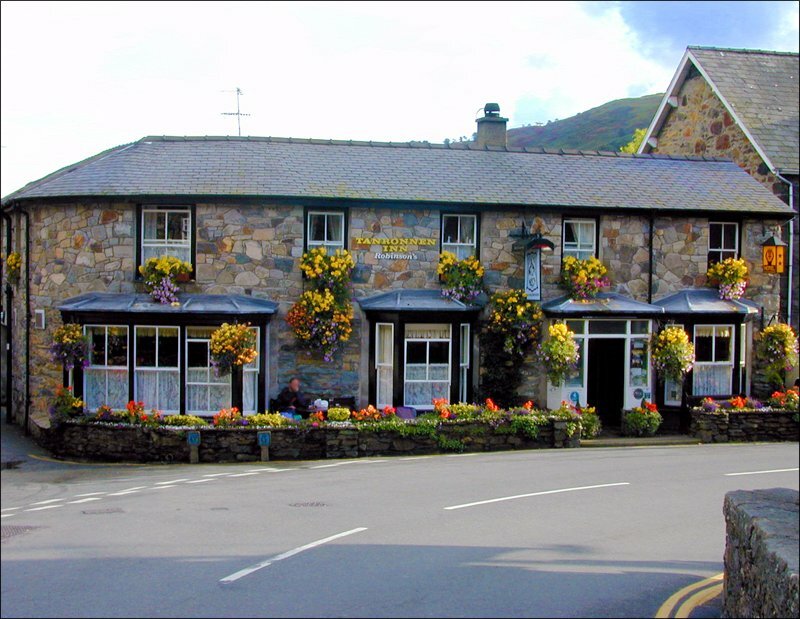 I drove from Berkshire to Beddgelert on the Thursday evening (about 5 hours) and stayed at the Tanronnen Inn, a lovely little pub with a great open fire and simple but comfortable rooms. At just a few kilometers from the car park at the bottom of the Watkin Path this was the perfect place to stop over. I got up early on the Friday morning and was out of the pub by 06:20 but I struggled to find the car park at Nant Gwynant at the base of the Watkin path as it (the Watkin Path) wasn’t signposted particularly well. My mistake for not getting the car park in the satnav before the visit. The car park is £5 for the whole day and it has toilet facilities. 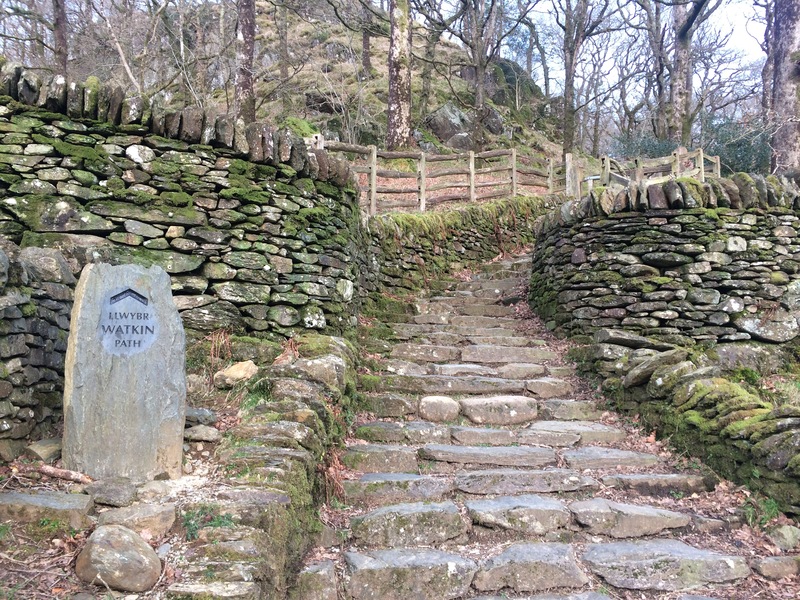 The aim was to use the Watkin Path, starting at Nant Gwynant, following this path up to the ridge that runs between Snowdon and Lliwedd and from there turning southeast to activate Lliwedd first. 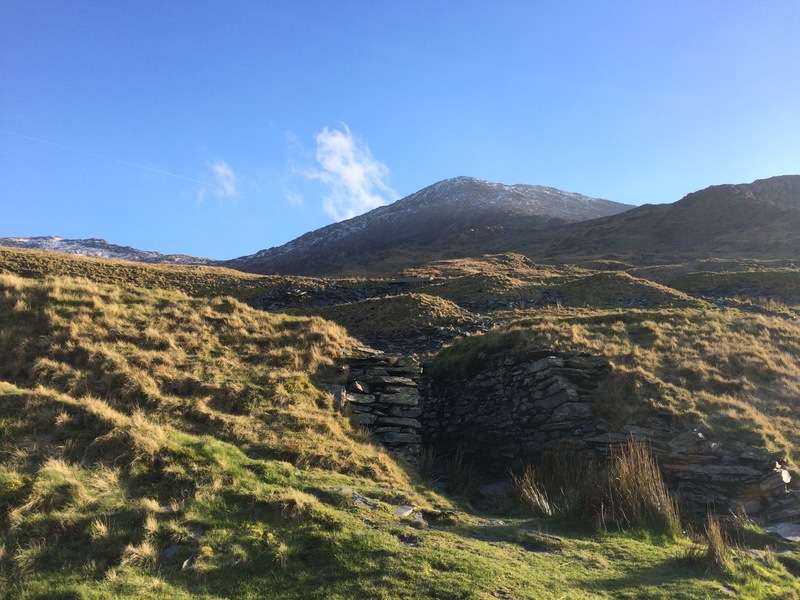 After activating Lliwedd I would return to the ridge and traverse to the Snowdon side and continued on the Watkin Path to Snowdon's summit. From Snowdon I planned to take the Rhyd-Ddu Path along the Bwlch Main ridge before descending along Clogwyn Du and then climbing Aran, my final summit. 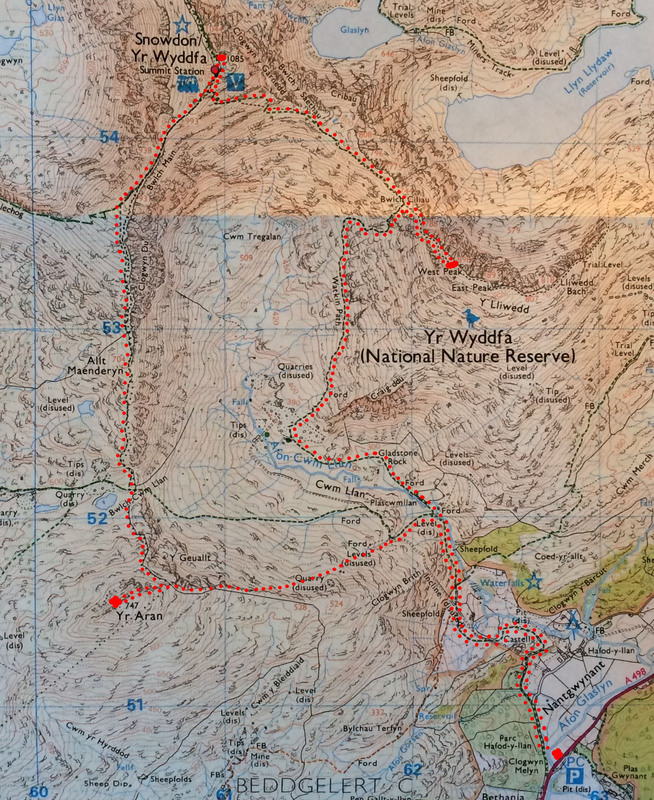 From Aran that map suggested it was possible to strike out east/northeast to rejoin the Watkin Path just above the ford and from their descend back to the starting point at Nant Gwynant. The initial ascent was easy with a well-made, broad path through the woods and all the way up past the Gladstone Rock about 40 minutes into the climb. Aran was to my left but I couldn’t see Snowdon and Lliwedd until I rounded a large rocky outcrop called Craig-duu. From here the path turned north and got much narrower and much steeper but still very distinct. At about 650m the water that wasn’t flowing in streams started to be frozen and snow laid in patches all around. As the water runs down over the path it was slippery and treacherous. It started getting cold here; a mix of altitude and the wind coming over the ridge that runs northwest to southeast between Snowdon and Lliwedd. The final leg to the crest of the ridge (a further 50m of vertical ascent) was less clear, maybe down to the snow covering obvious tracks, but the well laid track was now gone. From the ridge I struck out southeast to the West peak of Lliwedd (GW/NW-008, 898m). Up close this looked like a monster! It was difficult to see where the peak was and there was no obvious path to ascend. At this altitude everything was covered with snow so where you may have otherwise been able to follow a worn track up the rocks I had no clues at all. I started a tentative climb, literally on hands and knees at many points hauling myself up steep inclines. The ice made for a slippery surface and approaching from the ridge I found there was a pretty sheer drop to the left that caused me to stop and re-evaluate. This was at the edge of my ability and experience and I had to be honest with myself and turn back if it was too much. Working my way around to the southern face of the summit made things a little less scary but still a very, very challenging climb in the snow and ice. 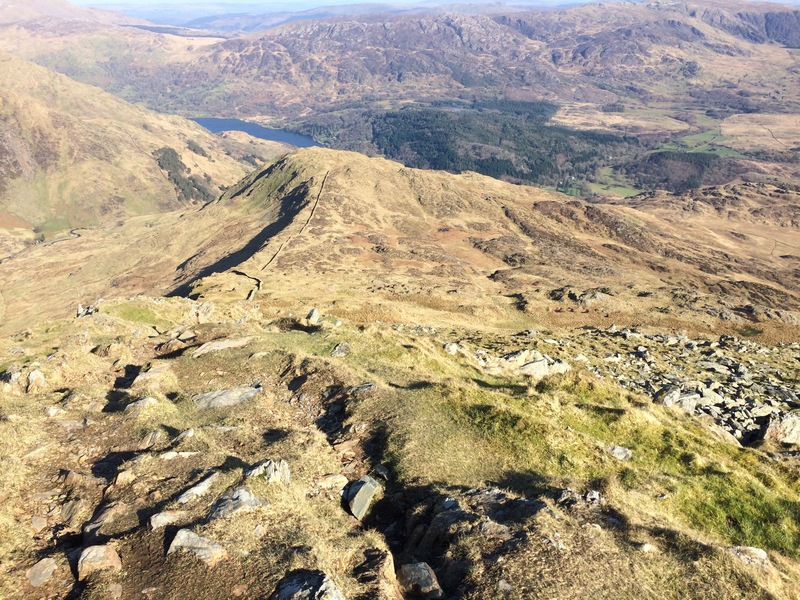 Suddenly I could see the summit…I had made it and, despite the wind down on the ridge the summit was relatively calm. I guess the wind hitting the sheer northeast face caused some sort of wing effect putting the lee side of the summit (just 3 – 4m from the absolute peak) in a little wind free bubble. I arrived at 09:40 and spent 40 minutes on this summit. I cracked out the 2m handheld and stood up the external aerial in my backpack and quickly worked 8 chasers. As I’d taken my telescopic pole and MTR5B I wanted to try and give some points away to more distant stations so I put up my 20m EFHW vertically and tried a bit of CW. 20m was pretty much dead…this was always going to be a risk which is why I’d taken 2m as a back up. I managed one Hungarian station but with no other takers and unable to spot myself I called it a day. I may not have been in the strong wind but the temperatures were sub-zero and my hands were getting cold. Descending back to the ridge was easier and I was able to backtrack my route roughly by following my tracks. The snow actually made descending easier as I could simply dig my heels in. Once back on the ridge I picked my away along it, the trail sometime clear other times less so. Where it becomes less obvious people have placed small cairns to mark the general route. From back here on the ridge I could clearly see a path heading up to the left of Snowdon…it appeared as a white track where nothing protruded from the snow. It was only when I saw someone descending that I realized just how steep the route was…they were having to hold on to the rocks around them to prevent themselves from falling. As I started the ascent to Snowdon (GW/NW-001, 1085m) it quickly became apparent just how steep it was and, to make matters worse the path was snow sat on top of scree…it made for exhausting climbing as you never knew when it was just going to give way and slide out from under your feet. Looking down encouraged me to always make sure I was ready to grab something…it requires total concentration. With such a steep climb every step was a chore…by now my legs were really starting to feel the strain and the acute angle your feet ended up was painful. Where possible I took advantage of the snow for traction and walked with my feet out at 45º ‘waddling’ up. 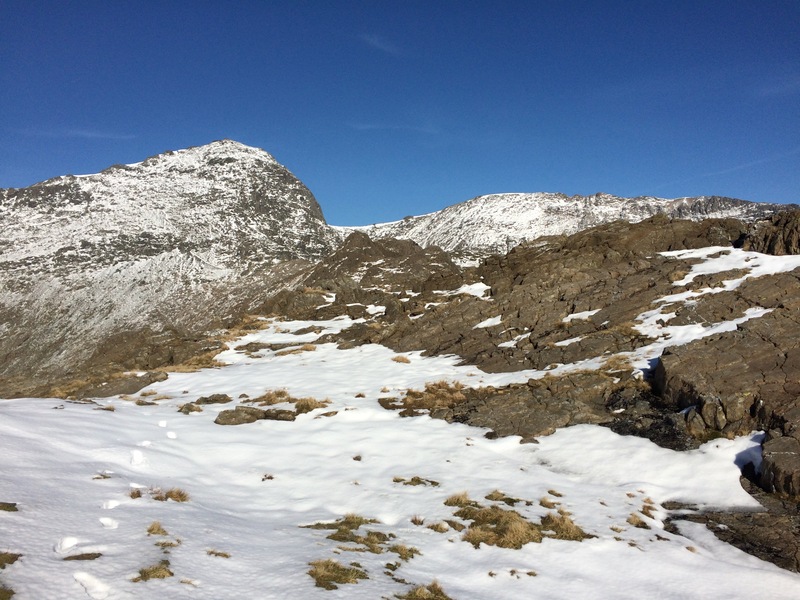 Once you start climbing it immediately becomes difficult to see the path in this final part of the Watkin path…maybe without the snow it’s clearer. Fortunately bags of stone had been dropped by helicopter ready for some work on the path and these formed markers for where to head next. As I started the last 50m of ascent I cleared whatever had been shielding me from the wind. 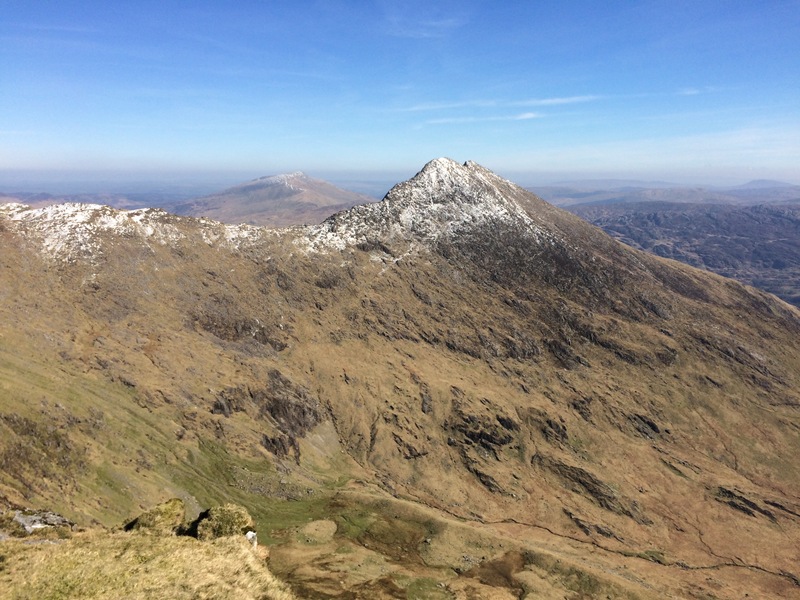 Unlike Lliwedd, up here I was feeling the full force of the 70 – 80km/h winds…fortunately pushing me up the hill! 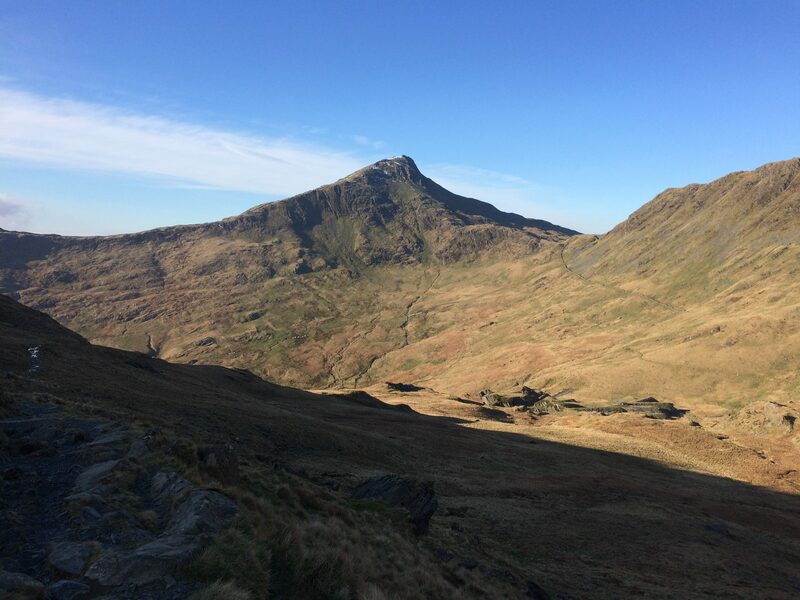 The Watkin Path brings you up onto the ridge joining the Rhyd-Ddu Path about 100m from the summit with a further 50m vertical ascent to go. The strong winds and deep snow made this slow going but after the previous, super steep section this was a walk in the park. 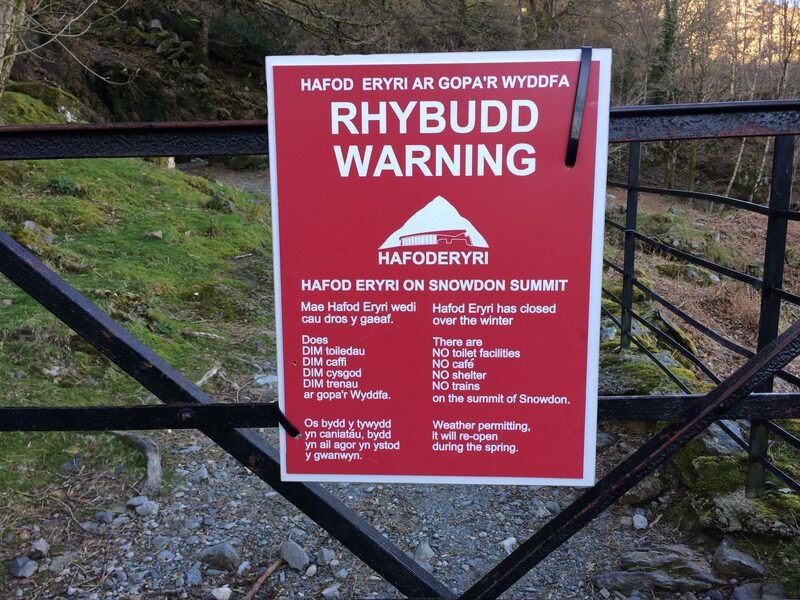 I arrived at the Summit at about noon and, although no trains run at this time of the year the summit was still quite busy with people who had walked up the Llanberis and Rhyd-Ddu Paths. I climbed up to the trig point to get the obligatory selfie but it was so windy I could hardly stand. I had to ask the congregation gathered there to let go of the trig so I could get a photo of the top of it! I tucked myself into a slightly sheltered spot just below the trig point and with so many people about and the extreme winds decided to just operate 2m. When I unpacked the radio I found it had switched itself on while being squeezed in the rucksack…it could have been on for up to 2 hours and I was worried about the battery state but all looked fine when I made a call. 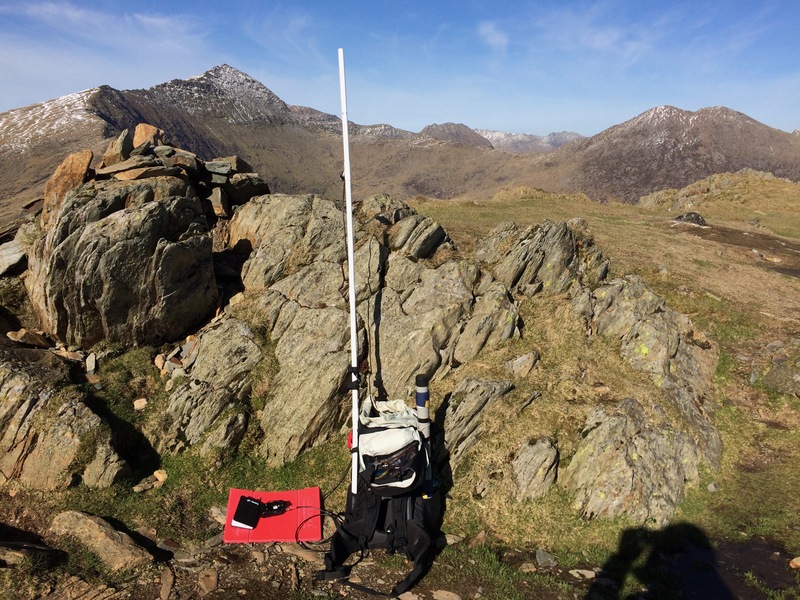 Strangely I struggled to raise stations from Snowdon and a few of those I did work reported low signals…I panicked that my battery was about to fail but I could see the indicator was at about 75% and eventually I got a few good reports. It was nice to work Twitter Ham Richard (GW1JFV) who was down in Pembrokeshire. Arriving at 12:10 I spent about 10 minutes operating then 25 minutes warming my hands back up in the shelter of the building before descending back the way I had come on the Rhyd-Ddu Path. I made my way along Bwlch Main, a long narrow ridge, in places thick with snow and buffeted by the wind blowing from the east. As the Rhyd-Ddu Path started to descend and bear west I turned south and kept descending along Clogwyn Du. A bit further down the Rhyd-Ddu Path I could see a walker with a shoe off and a few people standing around, clearly injured…later the mountain rescue helicopter flew in to extract him. From this point you drop from 930m down to 470m over a horizontal distance of about 1300m. It’s bloomin’ tough on the knees. By this point my thighs, calves and knees were complaining and a few time I slipped onto my arse as I lost my footing in the snow or scree. I slowed my pace to ensure I didn’t have an accident…the air rescue were busy already, I didn’t want them attending to me. The snow quickly cleared and this would be the last I saw of it on this trip. As I started the final ascent of Aran (GW/NW-019, 747m) the fields were sodden with water. I followed the path of a stone wall but this required some challenging climbing in some spots so I opted to zig zag up the grassy slopes where I could until the terrain forced me back to the wall. Eventually I came out onto a plateau where the wall I’d been following turned east. I looked up and, genuinely, my heart sank. If I thought the north face of Aran to this point was steep I had worse to go. I almost baulked…I almost gave up. My knees and thighs were screaming out not to take another step and I knew I had a long walk back to the car to go but I was so close. That last 100m of vertical ascent was true mind over matter. I just kept taking another step, and then another and another with lots of long breaks in between. 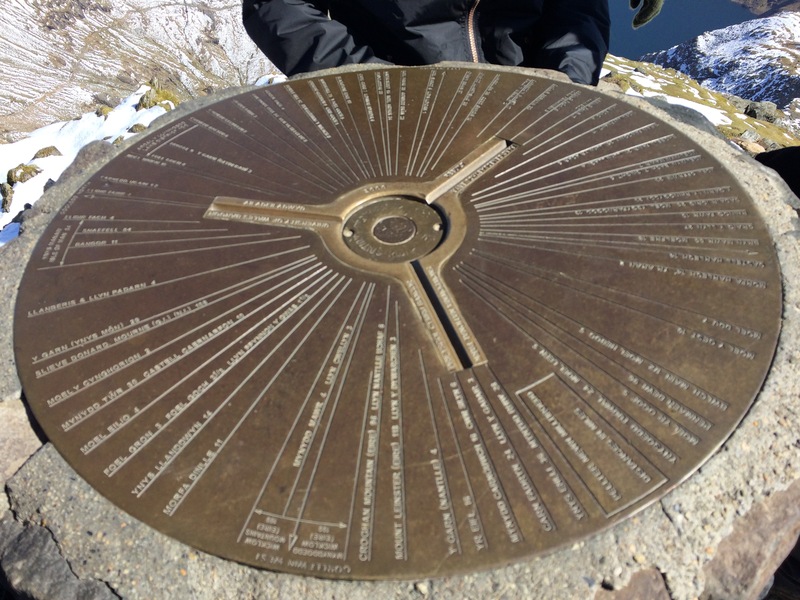 And suddenly I was there…I’d made it, my third and final summit. It was windy here again and I was exhausted. I knew I didn’t have it in me to set up for 20m and by now it was 3:00pm and I was keen to finish up and start the long trip back to the car. I worked a good handful of local and not so local stations including a Summit to Summit from an excited Si (M6IMN) who was just working his first SOTA at Pole Bank in Shropshire. After 30 minutes I packed up and started the descent. I’ve found it to be a truism that the descent can often be the most risky part of a climb/SOTA activation. On my OS maps I had seen what looked like a path following the wall just below the summit and heading generally east. I could see a couple of well equipped walkers about a 500m ahead and a group of youngsters with a satnav about 250m ahead of me so I followed this route with some confidence. I think we should have turned slightly north east to drop down into Cwm Llan but all of us continued east into an area called the Sheepfold. The descent in this area is rather challenging (200m vertical over 200m horizontal so about 45º). The youngsters headed further south looking for something a bit easier to try but I continued along Clogwyn Brith to a little ruin at the top of a stony descent marked as ‘Incline (disused)’ on the OS map where I had seen the two well equipped walkers going over the edge. When I got there I could see them picking their way down through the rocks very, very gingerly and I knew this was beyond my skill level. Instead I went directly east down the grassy slope. This was way, way too steep to walk down so I simply sat on my arse and propelled myself down in a sitting position avoiding the rocks and sheep poo and excepting the soaking wet arse I got from the saturated grass and moss. As it was I reached the main, wide path that I’d ascended on way before the others and as I walked down the final section to the woods I could still see the two walkers about halfway down, carefully climbing over the rocks and the group of youngsters still high up in the Sheepfold. I took the last 1km easy, conscious of not twisting a knee or ankle as my muscles were so weak with exhaustion wincing at every step…I’m such a light weight! I got back to the car at about 5pm, saturated with sweat, feet sore, knees hurting but pumped with the fact that I’d done it. Three summits in one day. Tired but buzzing with euphoria I opted not to seek out a pub for the night but to drive the 5 hours back home with only a stop for coffee and junk food. Note: Vodafone coverage was patchy and although I appeared to have a signal at a couple of points in the day the only successful SMS I managed to send was from Snowdon’s summit. Great effort Michael. I would have opted for a night at the pub with a meal and a glass of red stuff to sooth the aches. Well cool mate, interested in your antenna, fair play to you, that’s something I would at sometime I would be interested in doing. 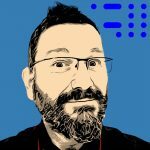 Nice walk, nice video, nice activation report!